The Apex Foot Health & Wellness customer service department can be reached by calling 800-252-2739 between the hours of 8:30 a.m. and 5:30 p.m. EST, Monday through Friday. At this time, Apexfoot.com orders can only be shipped to addresses within the United States or Canada. However, we have many retailers located throughout the world. Submitted orders are entered during business hours Monday-Friday 8:30 a.m. - 5:30 p.m. Apex does not ship orders on Saturday or Sunday. Orders received on business days are processed and shipped within 48 hours. For Standard (FREE) Shipping Orders, estimated delivery times are 5-7 business days from purchase date. In addition, Apex offers 3-Day Shipping for a flat rate of $15 and Expedited Next-Day Shipping at the UPS Published Rate. Orders are shipped via UPS with ground service as the default shipping method. WE CANNOT SHIP TO P.O. BOXES or APO BOXES. A tracking number will be emailed to you when your order ships. FREE UPS ground shipping to all U.S. addresses. Orders shipping to Canadian addresses are shipped at a flat rate of $19.50 per order. For expedited shipping and costs, please contact Apex customer service at 800-252-2739. What is Your No Hassle Return Policy? If for any reason you are not completely satisfied with your order, you may return your merchandise within 30 days from the date of purchase. For your convenience, each shipment contains a pre-paid return shipping label. If for some reason you need to return items purchase, use the shipping label to return free of charge. To obtain another shipping label or place an online return, click here. Our returns department will contact you with a return authorization number and shipping label. Please return merchandise in its original box if possible and include the provided return slip with returns instructions. Unfortunately, we cannot refund your original shipping charge. Please allow two weeks for your return to be processed. You will receive an email when your return has been processed. A credit should appear on your credit card within two billing cycles. If you return unworn merchandise after the 30-day period, but within 90 days of purchase, we will offer you a merchandise credit to use toward your next purchase. No refunds are available for merchandise returned after the 30-day period. If you suspect a defect on worn merchandise, the merchandise must be returned for an inspection and a determination of eligibility for a refund or merchandise credit. Please call 800-252-2739 for further instruction on returning defective merchandise. Return requests can be made through Apexfoot.com. If you are logged into your account, go to your order history. When you select an order that has shipped, click the option to request a return for an item or the entire order. 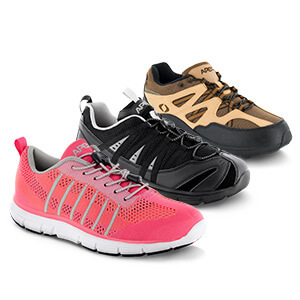 Can I wear APEX shoes with orthotics? All Apex shoes have at least one removable insole. Apex shoes have a minimum of 3/16” removable depth with many Apex shoes having as much as 5/16” to 1/2" removable depth which allow for flexibility of fit. A wide variety of orthotics can be used with Apex shoes. Athletic shoes can be cleaned by hand-washing them with a damp cloth and mild detergent. For best results, clean your shoes immediately after exposure to mud or dirt. Allow shoes to air-dry at room temperature. It is important that you do not machine-wash or machine-dry your sneakers. For leather shoes, wipe shoes clean with a dry cloth. Apply a shoe cream to leather using a circular motion. For nubuck or suede, brush gently with a soft suede brush to remove stains or marks. For stubborn stains, use a suede eraser first, then brush gently with a suede brush.